But you have to order a specific item from the menu to try it! Anyone would stare daggers at someone who’d mention that they found a pack of banana ketchup in their McDonald’s order or that they received the elusive packet as an alternative sauce to their meal. It’s impossible and social media doesn’t do much to prove its existence. 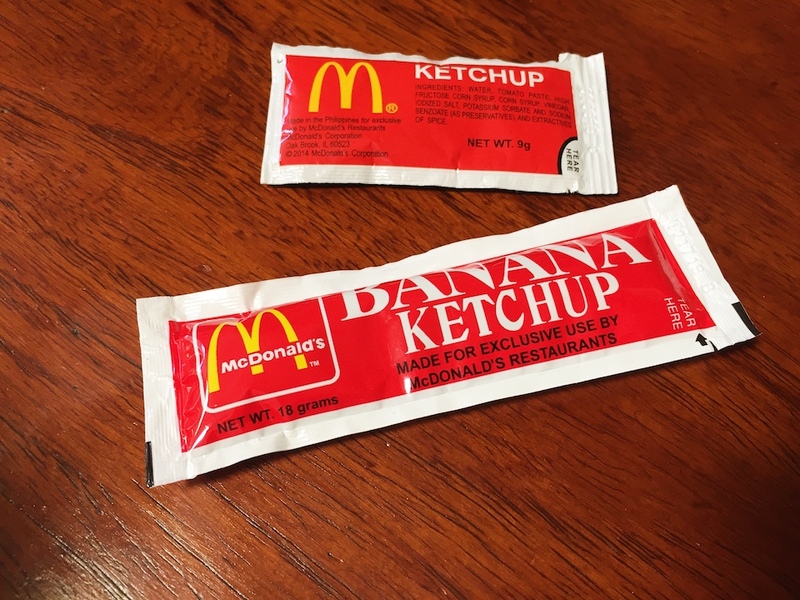 But there is that incessant buzz of a myth that the American fast food chain actually offers banana ketchup. Ladies and gentlemen, it’s real, it’s here, and it’s actually something we got to try in a recent order. 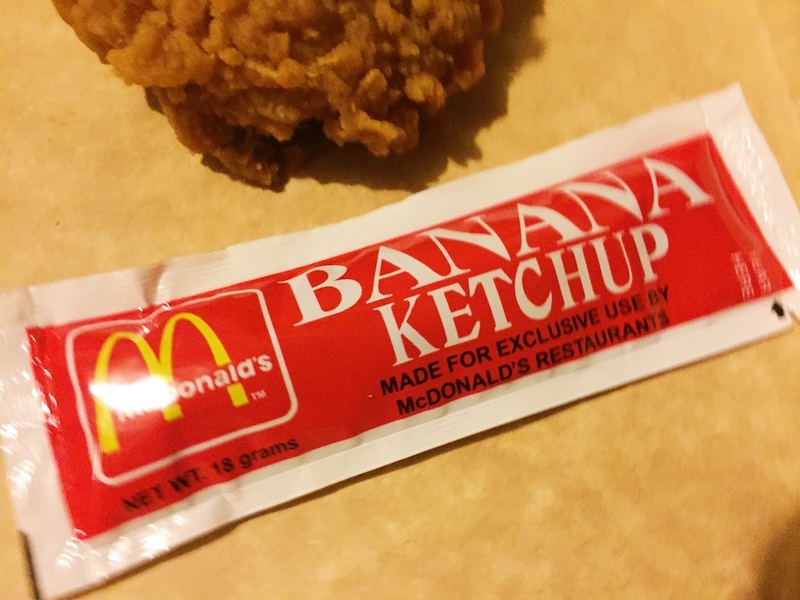 The McDonald’s banana ketchup is not just another product of rumors and hearsay. There exists in the physical world a red sachet of about four-and-a-half inches emblazoned with the trademark yellow M logo. The pack, filled with 18 grams of the fruity ketchup, is double the size of the typical sachet of the tomato variety. Banana ketchup is, of course, that ubiquitous Pinoy pantry staple that everyone grew to love or to hate. There’s just no in-betweens. As its name obviously suggests, the ketchup is made out of bananas, mashed and dyed to a distinct red. It’s flavored with the usual slew of spices with a hint of sourness from vinegar and some sweetness from sugar, yet it barely tastes like the usual sour-ish tomato ketchup popular in the Western world. The banana ketchup, though, is also a by-product of Western influence. The story goes that there was a shortage of tomatoes to make ketchup during World War II. The Philippines, as a tropical country, offered a bounty of bananas, which became the ketchup as we know it. Households usually pair the ketchup with anything fried or grilled or even microwaved—from cheese sticks to tortang talog to hotdogs on a stick with marshmallows. But at McDonald’s, you can only have your fill of the ketchup with an order of their crispy, golden chicken. (We tried ordering just fries but even the manager wasn’t keen on giving the sachet to us with just that order.) It made sense actually. The saltiness of their chicken proved to be the perfect match for the sweetish banana ketchup. We’d actually even consider taking banana ketchup again next time instead of gravy. An insider also sheepishly shared with us that the banana ketchup sachets are an actual local product of the food chain. Although some branches may be oblivious to its availability, the branches in Makati that we visited easily offered the packet with our chicken orders. Apparently, they usually offer banana ketchup when the stock of the original tomato blend goes low or if a large order of chicken meals is placed. Don’t we all look for something unique when visiting a McDonald’s branch overseas? Well, here in the Philippines, we have banana ketchup.